outdoors in the balcony: you can see that as early as beginning of April it is developing buds! April 09 2004 After the winter, all plants you sent last fall are in absolutely fine condition! They stayed outside the whole winter, on my somewhat sheltered balcony not far from the centre of Berlin. Temperatures, however, were not quite extreme this winter, and there was rather little snow. 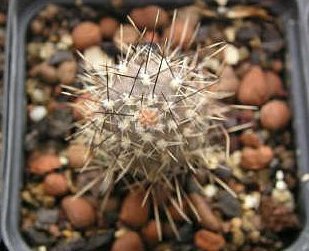 Anyway, the plants were kept away from most precipitation and only once covered by a bit of snow. 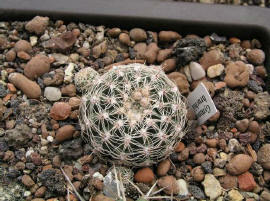 Sclerocactus glaucus together with Gymnocalycium chubutense (top) and bruchii var. niveum (left) which are also fine.